Rose Baker Senior Center, 6 Manuel F. Lewis St.
Addison Gilbert Hospital, Cafeteria, 298 Washington St.
Sawyer Free Library, Friend Room, 2 Dale Ave.
Bank Gloucester, Community Room, 160 Main St.
High Dose (senior dose) for those 65 years of age and older will be available at public clinics while supplies last. Please bring your health insurance cards. We do accept those without health insurance. 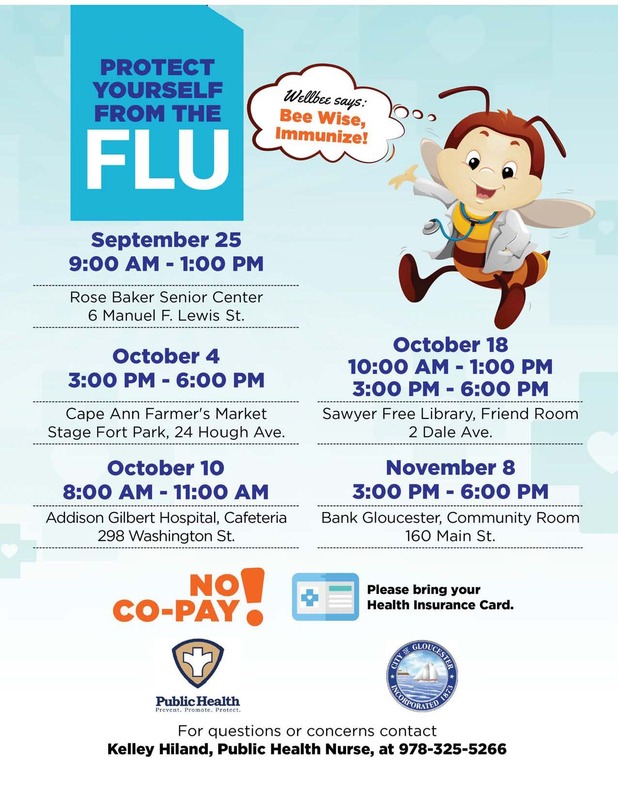 By getting your flu shot at a City of Gloucester sponsored flu clinic, we use insurance reimbursement to purchase flu vaccine year after year and other vaccine like Shingrix (shingles), Tdap, and Hepatitis B. We value our community members who support the overall health and well-being of Gloucester!